We transferred everything from the old website to the new one in organized pages. 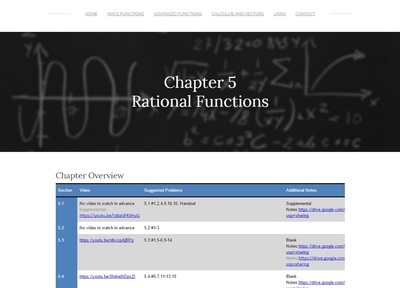 First, users will see Ms. Ma's classes at the top of the homepage. Hovering over the classes will bring down a menu of chapters. Creating separate pages for each chapter in drop-down menus makes sure that students don't get confused as to where they can find whatever they need while at the same time reducing the number of clicks to get to the it. 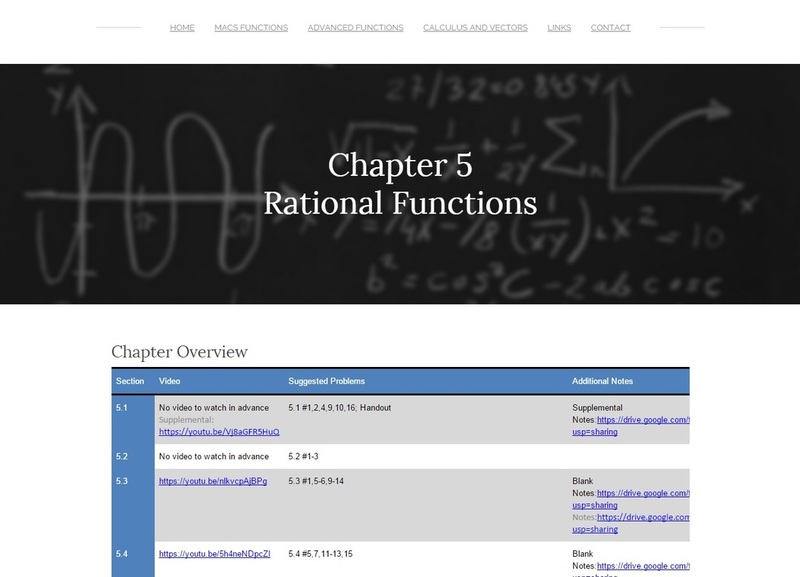 In each page, all of the material pertaining to the chapter has been uploaded. This includes chapter overviews, YouTube lessons, Kahoot links, and solutions to worksheets. 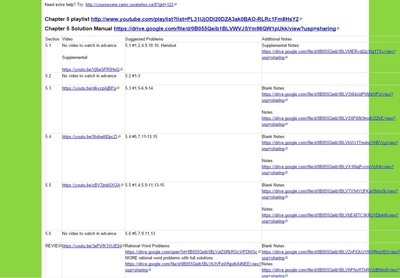 There is also a Links page, where Ms. Ma can share links that she suggests students use such as graphic calculators and YouTube vlogs. Lastly, there is a Contact page where students can send a quick question or comment. The submissions are sent directly to Ms. Ma's email. Google Calendar is suitable for any class and is useful for both students and parents. It allows teachers to create a calendar that contain events like lessons and tests for each day of the week. With this tool, students can view what happened in class while they were absent or view the breakdown of a test by clicking on the date for a description. In addition, it is a great way for parents to see what their child is learning in class. Google Calendar is a very effective organization tool for any class because it enhances learning by keeping students on track of their studies. Weebly is a platform for creating a website. It has a wide range of themes to choose from, contains many features, and is user-friendly. Some of its features include the option to add a slideshow, map, forms, buttons, search box, videos, files, surveys, forums, and so much more. Teachers can use it to embed a calendar or Youtube video, post lessons, and attach files for students to download. Another useful feature is the option to add a contact form. Students and parents can leave a comment that will be emailed to the teacher. A website that contains class material is effective for learning because students can access it from any device with internet connection. Microsoft Word In order to keep Ms. Ma's class schedules organized, we uploaded her Chapter Overview charts from her previous website. 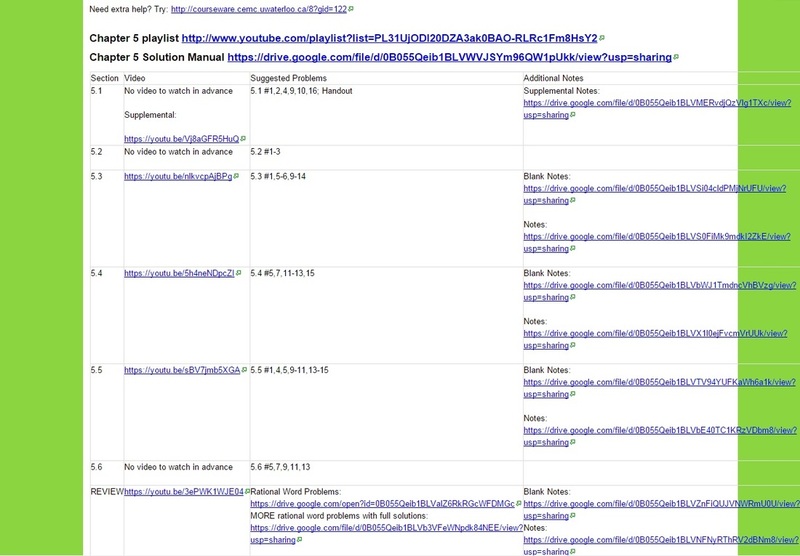 These charts tell students which YouTube video to watch for each lesson as well as suggested questions to do and additional notes about the lesson. However, to keep the theme of the website consistent, we also changed the look of these Chapter Overview charts. To do this, we made visually appealing tables in Microsoft Word and then saved them as html files. Then we opened them on Notepad and copied the html code into the site to produce a clean, integrated chart. 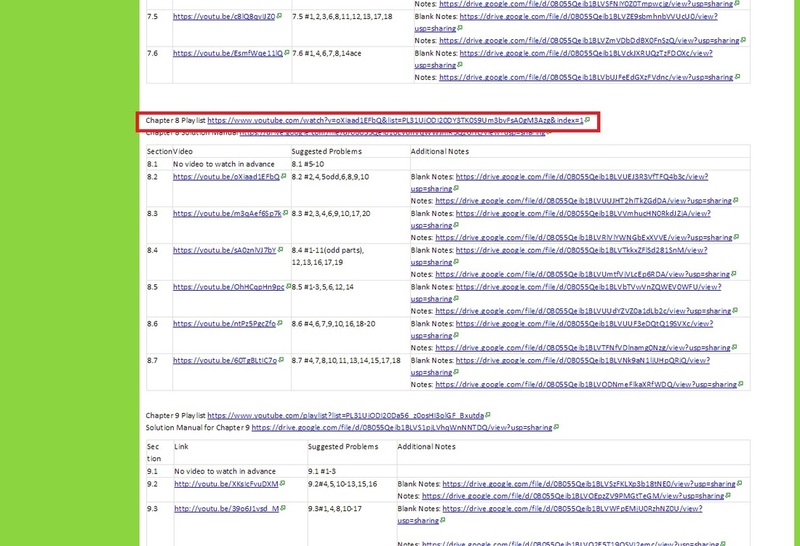 The html files used for the Chapter Overview charts can be found at the bottom of this page. We also embedded Ms. Ma's YouTube lessons. This was not difficult as Weebly allows for easy integration of YouTube videos and playlists. 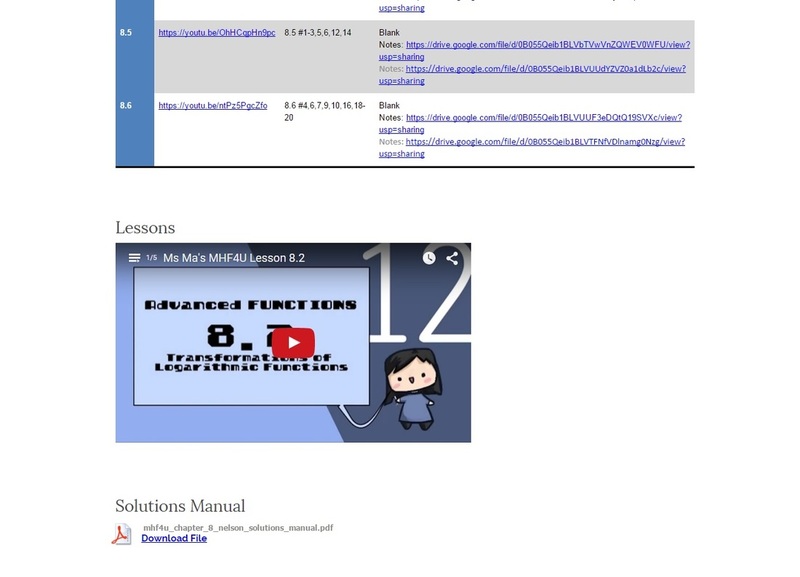 Every chapter has a link to each playlist, as well as a YouTube player so that students can watch the lessons directly on the site without opening another tab. Possible uses in other classes/subject areas. 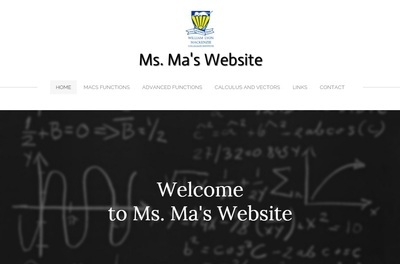 Ms. Ma's website has an abundance of resources for any math student, regardless of his/her teacher. For students that are sick or miss a lesson, the YouTube lessons can easily be found for a quick make-up lesson. For extra practice, students can also download worksheets and solutions. 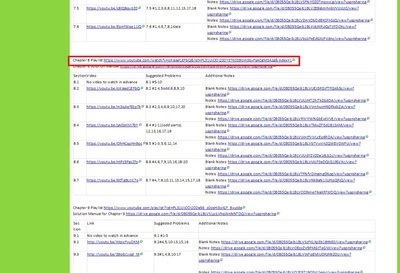 ​As said before, Ms. Ma shares many helpful links. A notable link that she uploaded is a vlog by Thomas Frank, the college info freak, that gives eight pieces of advice for studying. 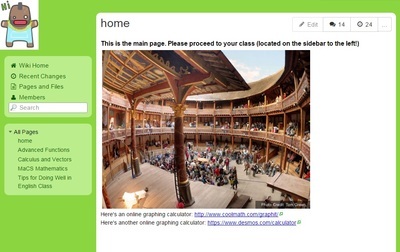 Links like these would be useful to any student in any subject area.